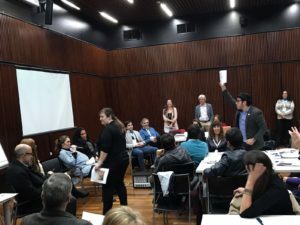 This workshop was designed for scientists and policy practitioners living or working in South America to enhance capacities their in providing science advice for policymaking at all levels of government. The workshop occurred on the 28th and 29th of June 2017 in Buenos Aires and brought together 60 (emerging and established) scientists and policy practitioners and key stakeholders for a dialogue on models of science advice, and promising practices for working at the interface between science and policy. This will form a basis for a network of science advice stakeholders in South America. Read the Full Workshop report (English). The workshop was held in Spanish and was being coordinated by the Ministry of Science and Technology, Argentina in collaboration with INGSA. Prior to the workshop, on Wednesday 28th June, an open symposium was held to discuss the role of science advice in policy making. This included include presentations from Robin Grimes, Chief Scientific Advisor, Foreign & Commonwealth Office UK; Ernesto Polcuch, Chief, Science Policy and Partnerships Section of UNESCO; Peter Gluckman, INGSA Chair and Chief Science Advisor to the Prime Minister of New Zealand and others.